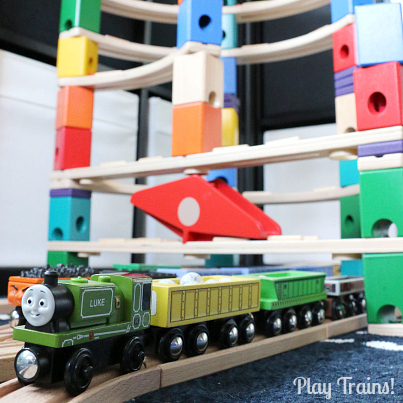 When I made these laminated train pieces, I wasn’t planning to incorporate them in water play. But now that we’ve happened upon that use for them, I can’t wait to make more! 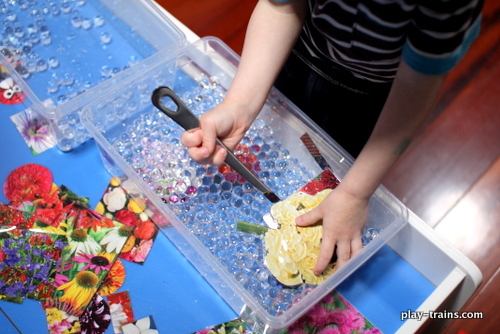 These waterproof play pictures are great for both bath time and all kinds of water or messy play. Next time, though, I’m going to let the Little Engineer pick the pictures. Why? Well, that’s part of the story of how sending our Flower Train crashing and splashing into a water bead river was the only way to save it. 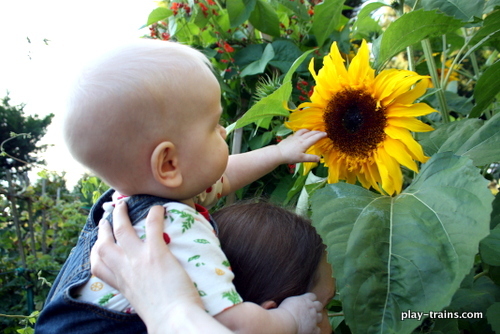 When we first bought our house, I was very enthusiastic about the idea of gardening in our big backyard. I splurged on some fancy tulip bulbs from a couple of online flower retailers. I did plant a tulip garden that year, but I was discouraged when the colors didn’t quite live up to the beautiful photos on the website. I think I was supposed to fertilize them or something. Every month or so since then, their catalogs have arrived in the mail. I have a hard time throwing them out. The photos of the flowers are so beautiful, it seems like I should do something with them. One morning, leafing through a flower catalog while the Little Engineer finished his breakfast, I thought of something to make. 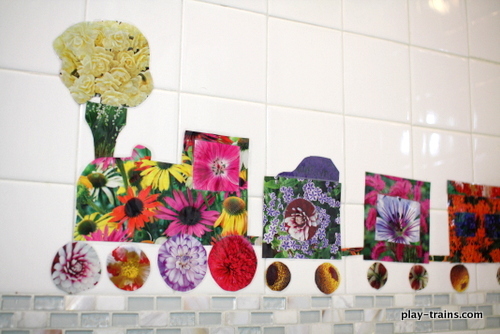 I could cut train shapes out of the flower pictures and make a flower train! It was perfect timing. We could do an activity with them that day and get it up on the blog in time for Easter. 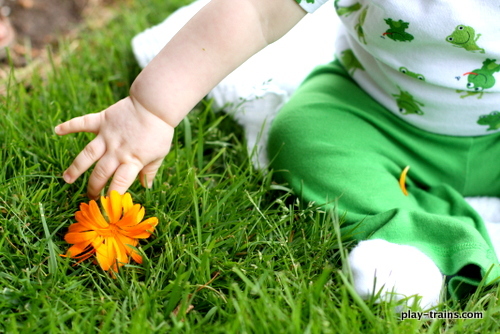 And of course the Little Engineer would love it, I thought, because he loves flowers. When he was still little enough to ride close to me in his baby carrier, there was one thing we had to do whenever we went to Costco: stop and smell the roses…quite literally. He loved the colors and the scents. I suspect he also loved taking a moment in the middle of a busy shopping trip to do something quiet and beautiful with his mama. I set to work cutting out shapes similar to the ones I’ve made for our felt trains in the past. I enjoyed trying to match the shapes and colors of the flowers with the different parts of the train. Dahlias and the centers of other flowers made wonderful wheels. A cluster of white blooms would serve nicely for steam, lilies of the valley became a funnel, and a large picture of red flowers was perfect for the caboose. I made medium and large rectangles out of brightly-colored flowers for box cars and passenger coaches, small rectangles filled with tiny, dark blooms for windows, and short, skinny rectangles for couplings to go between the cars. I even found a bank of dark purple flowers to cut in the shape of coal for the tender. Once I had the shapes cut out, I had to figure out what to do with them. They would have been fun to use to make a collage, but the Little Engineer doesn’t have much interest in gluing things to paper at the moment. Seizing on an excuse to use my thermal laminator, I decided to laminate the train parts to make them last. The Little Engineer watched the lamination process with great interest from a safe distance, and I got more and more excited to play Flower Train with him. As I was cutting out the laminated pieces, the Little Engineer came over to watch once again. “What are those?” he asked me. “No,” he said in a tone of finality, and walked away. All I could think of was my baby, always wanting to visit the flowers at the store. An image that was now very distant in my mind, as close as it felt to my heart. I put the flower train away, intending to finish it another day. Easter came and went. I realized I didn’t know where the bag with the flower train pieces was. Then Mother’s Day approached. I thought I’d have another look around for the flower train. It wasn’t as lost as I had thought, because it only took me a minute to find. I sat down and cut out the rest of the pieces. Once again, The Little Engineer was interested in what I was doing, but not the idea of playing with the train parts. This time, I didn’t give up at the first sign of disinterest. One of the things I’ve learned about him is he lives in a state of constant make believe. 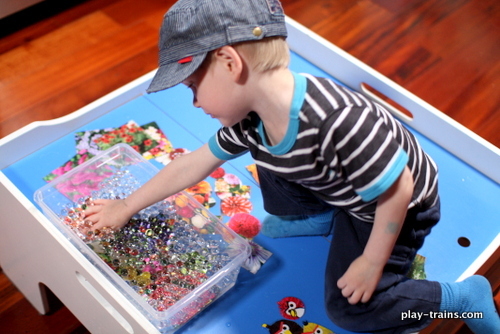 Because of this, adding an aspect of pretend play to any activity significantly increases the chances that he’ll want to do it. “Do you need something more to the flower train to make it fun for you?” I asked him. “Mmm-hmm!” he answered, his eyes brightening with interest. 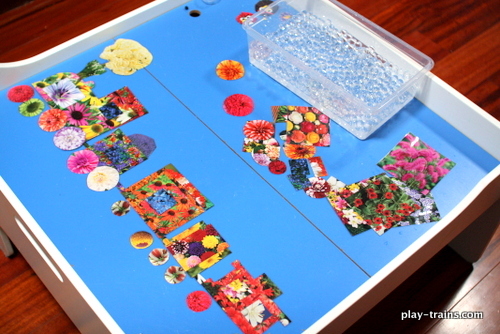 My mind raced through a few ideas before this thought occurred to me: the flower train pieces were laminated, and I’d been careful to cut them out so the plastic was sealed all the way around. That made them waterproof! My first thought was to somehow have the flower train pieces “grow” from seeds in real dirt. Then I remembered how much the Little Engineer likes getting his hands dirty — not at all, unless he chooses to do it on his own — and tried to think of something else. 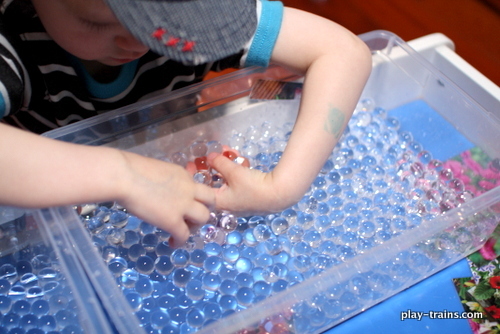 In the end, I invited him to submerge them in a tub full of water and water beads. As I set the activity up, I explained to him that the Flower Train was going to derail and crash into the water bead river. Then it would be his job to fish it out and put it together. He loved this scenario, and was completely focused on the activity for at least a half hour. He didn’t want to arrange the flower train, so in the interest of getting him to play with it in any way at all, I did that for him. 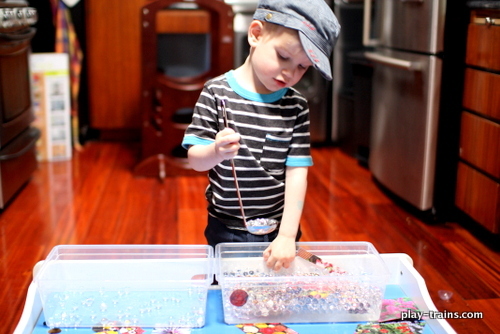 Once I was finished putting the train together, he dove into the task of “crashing the train” and submerging it below the water beads. He took his time carefully pushing each piece beneath the surface. 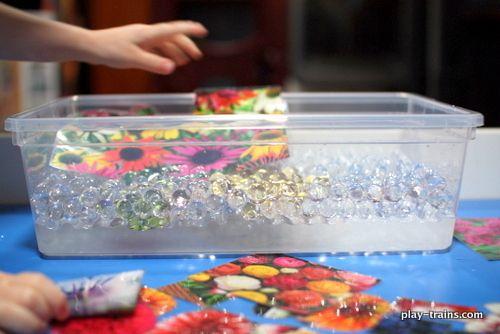 The colors of the flowers looked so pretty lit up by the light pooling in the water beads. 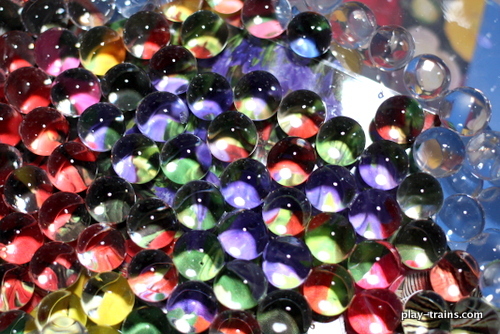 A closer look revealed the beads were magnifying the images below. We could easily see the dots of color created by the printing process. I pointed this out, and he climbed on the train table to see better — for once, I didn’t make him put his feet right back on the floor. 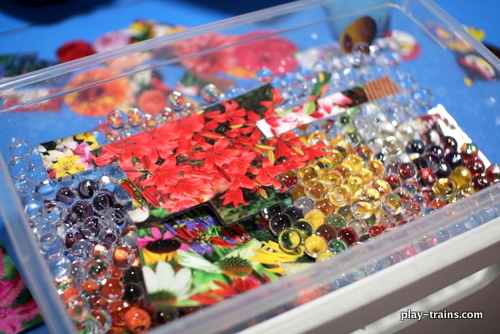 We talked a little about the magnification of the images, and how the beads were working as small lenses. 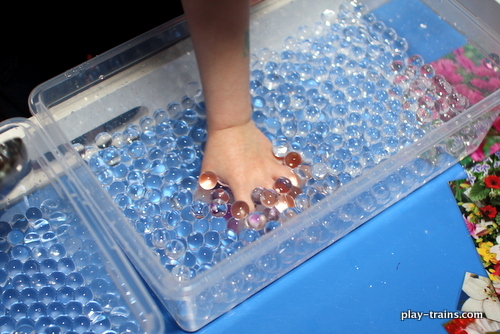 I remembered from past experience that the image would also be flipped by the water beads. This could be a fun science exploration to revisit in the future with a little review on my part of the scientific principles at work (surely someone has done an awesome blog post about this!). On the other hand, I think it was probably just as beneficial for him that he saw me get genuinely excited and try my best to figure out the explanation on my own. Soon, the whole tub was full of the laminated train pieces. It was time for the rescue effort to begin. 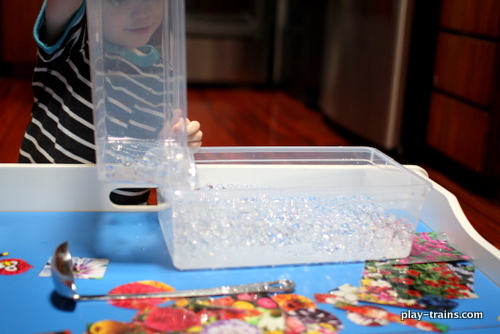 He asked for a tub to put water beads in, so I found one. 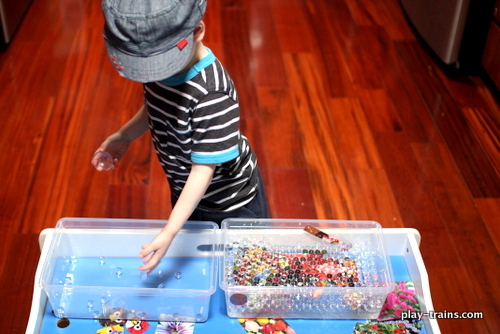 At first, he moved the water beads in fistfuls to the new tub. That proved to be a slow process, so he asked for a tool to help. We went to a kitchen drawer and found a ladle. 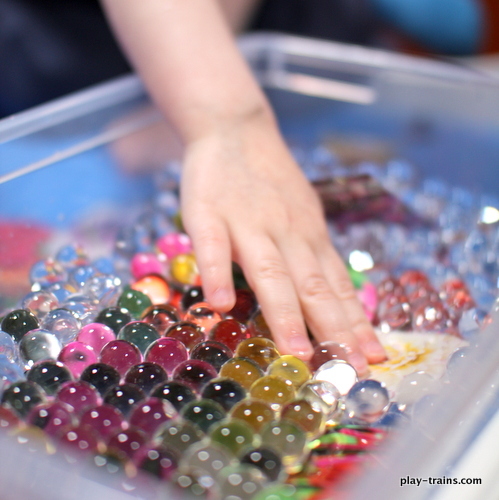 When the Little Engineer thought he had rescued all of the train parts, he dumped the beads he’d moved to the “rescue tub” back into the original tub. But then he noticed he wasn’t finished. There was one piece left, stuck to the very bottom of the tub! He worked valiantly to get it out. But as I discovered when he finally broke down and asked me to help, it really was stuck, held down with suction. So I lifted it a little from the bottom with my fingernail, and he pulled it out. And then, as completely as he had been absorbed by the activity, he was done with it. He didn’t want to put the train together. And that was okay. I’d found the place where he would meet me, where this would be as fun for him as I had originally expected. I hadn’t even needed to use the flower Angry Birds I’d made to get him to do it, although at that point, they did go for a swim in the river. While I was fine with that being the end of my son’s play with the flower train, I’d noticed that once the laminated pictures were wet, they stuck to the smooth surface of the train table. So a week or two later, I decided to try them out in the bathtub. The Little Engineer was playing by himself, so I went into the bathroom and stuck a few pieces to the tile above the tub. The Little Engineer came in, saw what I was doing, and started shouting in joyful excitement. “Do you want to take a bath?” I asked him through his stream of words. Yes! My thoughts echoed his response as he stripped his clothes off in record time and started running around the house. Finally, he’s going to build the train! I knew he would like it! I knew this was a cool idea! 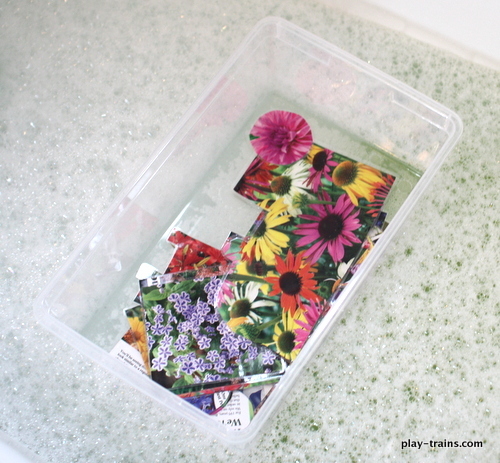 I filled the bathtub and put the flower train parts in a small tub, floating on the bubbly surface of the water. The Little Engineer could hardly wait to climb in. He picked out the engine piece and stuck it halfway to the wall. Then he put it back with the other pieces. This time, I just had to laugh at my dashed hopes. I helped him pick out other bath toys. 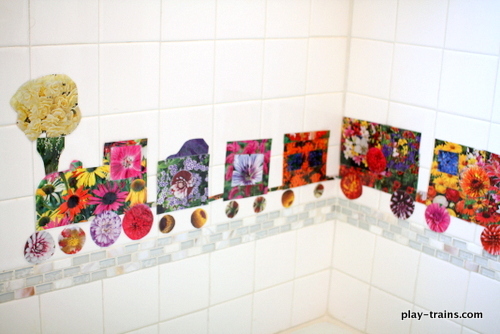 When he was happily playing, I put my flower train up on the tile wall. And you know what? I loved it as much as I thought I would from the beginning. As a kid blogger, I naturally turn to my son for a real kid’s opinion of my ideas, but he’s only one kid! If he doesn’t go for one of my activities, it doesn’t mean it wasn’t a good idea. It just wasn’t for him. Another kid — and maybe lots of other kids — might love it. And as for the bittersweet process of watching him grow and change, that’s something I’ve been dealing with since the night before our ultrasound. I almost changed my mind about learning if the tiny life growing inside me was a girl or a boy and giving it a name, an identity separate from me. Even then, I knew this lifetime of letting go wouldn’t get any easier, but at least now I have daily proof of why it’s also a wonderful thing. All the stories and ideas he has that I would never think of myself. All the things he falls in love with that I find myself loving, too. Of course, he couldn’t leave me too sure of his opinion of the flower train in the end. When he got out of the bath, he commented that the “train decorations” were for Train Day. I’m pretty sure we’ve had a few Train Days since that one, and he hasn’t put the flower train back up yet. But who knows…maybe he will. Next Train Day. I Love the last part of your post. You are so so right… we learn when we teach 🙂 all the time. Thank you so much for taking us with you on this journey! It somehow means so much more to keep it real and not pretend that the activity went as planned. And I *so* know about having great ideas that your child has zero interest in! Thanks. 🙂 I tried to write this as two separate posts, so the activity wouldn’t get swallowed by the story, but it didn’t work for me for just that reason. I couldn’t talk about the activity without explaining why we did it in the first place! 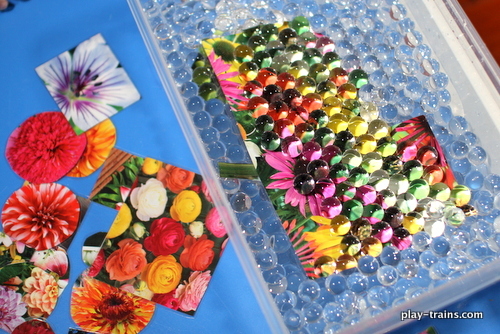 I love the effect of the flower train behind the beads! What a wonderful idea! I have pinned this post. Thank you! I was so delighted when I first spotted it. What a fun idea! 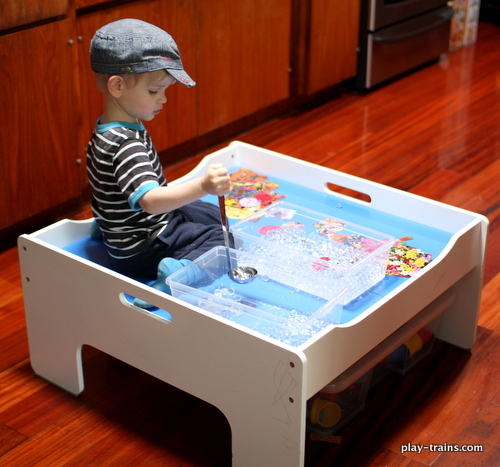 I would love to know the brand/name of the train/play table pictured above. Thank you! Unfortunately, I have no idea about the train table. It was a Craigslist find of my mother’s. Sorry! Thanks for reading! 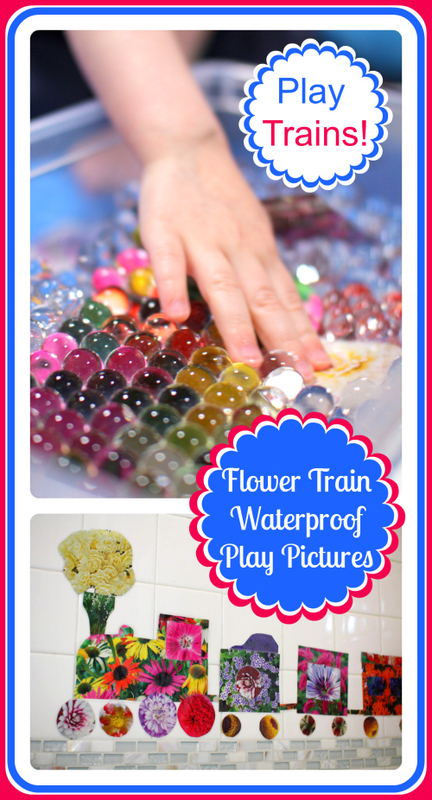 I love how the flower train pieces looked as the water beads magnified them! 🙂 And I really appreciate your story about how Little Engineer didn’t get into the activity the way you thought he would. Isn’t that how it goes sometimes? The way you determined what his interest was and worked with that was awesome. (Oh, and I cannot get over the flowered Angry Birds)! Thanks for linking up with Stress-Free Sunday! Thanks, Mary Catherine! It was certainly an interesting learning experience…like most things are around here. 🙂 Life just goes better when you follow their lead and work with them instead of against them.